THREE LABOUR MINISTERS dropped from Cabinet as part of reshuffle have been handed spots on Oireachtas committees today — replacing party colleagues who were handed promotions. Pat Rabbitte – who was said to be ‘fuming’ after being sent to the backbenches last week by new party leader and Tánaiste Joan Burton – is to join the Committee on Finance, Public Expenditure and Reform in place of Kevin Humphreys, who was elevated to the junior ministerial ranks this week. Ruairí Quinn, who resigned as Education Minister in advance of last Friday’s reshuffle, takes Minister of State Aodhán Ó Ríordáin’s place on the Committee on the Implementation on the Good Friday Agreement. Joe Costello — dropped as a junior minister in the second phase of the coalition’s reshuffle on Tuesday — will join the Public Accounts Committee, replacing new ‘super’ junior minister Gerald Nash. Nash’s seat on the foreign affairs and trade committee will also be taken by Quinn. The TDs won’t receive any extra payments for their appointments — only committee chairs receive an extra allowance: currently the going rate is €8,740 annually. In other appointments announced today, Robert Dowds and Eamonn Moloney (both of whom are Dublin TDs) will take the places formerly held by Nash and Humphreys on the Select Committee on Environment, Culture and the Gaeltacht. Elsewhere, Fine Gael’s Marcella Corcoran Kennedy joins the jobs and enterprise committee, replacing the newly-promoted Damien English. And Labour’s Michael Conaghan takes Ó Ríordáin’s seat on the Select Committee on Education and Social Protection. Email “Guess who's back?... Pat Rabbitte and Ruairí Quinn replace new ministers on committees”. Feedback on “Guess who's back?... 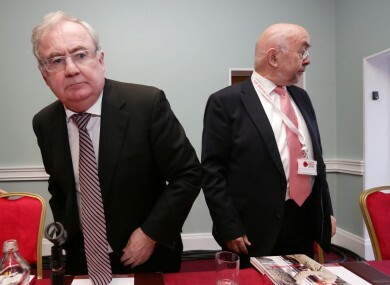 Pat Rabbitte and Ruairí Quinn replace new ministers on committees”.